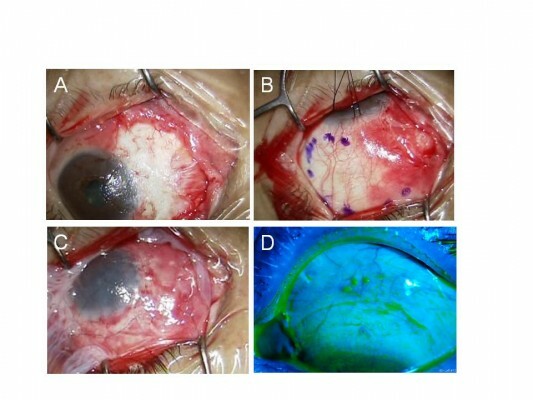 Purpose: The aim of this study was to evaluate the clinical outcomes of surgery for recurrent pterygia using mitomycin C (MMC), double amniotic membrane transplantation (AMT), and a large conjunctival flap. Patients and methods: This retrospective case series included 31 eyes in 31 patients with recurrent pterygia. All patients underwent pterygium excision, application of MMC, double AMT, and placement of a large conjunctival flap. Outcome measures were visual acuity, astigmatism, and recurrence. Recurrence was defined as the presence of fibrovascular proliferative tissue crossing the limbus. Results: The patients’ mean age was 68.2 years. The mean follow-up period was 3.6 years. The mean preoperative and postoperative best-corrected visual acuities (logMAR conversion) were 0.23 and 0.13, respectively. There was a significant difference between the mean preoperative (−3.85 D) and postoperative (−2.22 D) astigmatism. The recurrence rate was 3.2% (1/31 cases). Conclusion: Surgical pterygium excision with application of MMC, double AMT, and placement of a large conjunctival flap was an effective treatment for recurrent pterygia.